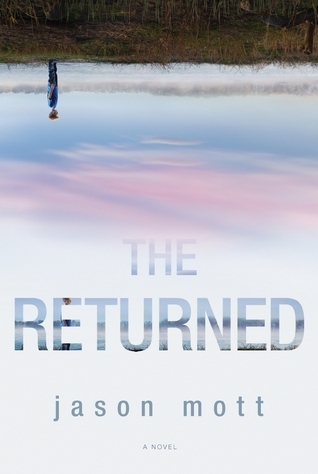 Thanks to TLC Book Tours, we're pleased to present a review for The Returned, a new sci-fi/paranormal novel by Jason Mott. Make sure to check out the rest of the tour stops to see other reviews! While this is a book about people inexplicably returning from the dead -- in a whole, healthy way, not a brain-eating zombie sort of way -- you shouldn't go into this book expecting it to be a whirlwind, fast paced sci-fi adventure. It's a slow burning look at the way a small town and its residents are forever changed by the phenomenon of the Returned, focusing on the Hargrave family, who have to deal with their newly Returned son, Jacob. It's a very moving story about humanity, and the way people deal with oftentimes very drastic change. The main story follows Harold and Lucille as they cope with suddenly being parents to a young boy who's been dead for something like fifty years, and how the small town of Arcadia copes with an influx of people who should be dead, both from Arcadia and from across the world. Very slowly, the town starts to change in some incredibly ugly ways, and by the end, no one is left untouched by the Returned. The Returned offers up a lot of moral/ethical questions throughout the story. Are the Returned really people? Are they even real? If they're not people, then does it matter how they're treated? What happens when you die? Is this a religious event? Does death even have meaning anymore, when the dead are being brought back to life? No one in the town -- not the preacher, or the government, or people for or against the Returned -- have the answers to these question, no matter how badly they'd want them. While usually I would want a book to try to answer some of these questions, in this case, it felt right that so much was left open to interpretation. I feel like this book would make for great discussion at a book club, just because of all of these open ended questions. Watching Harold and Lucille deal with Jacob, and the larger matter of all of the Returned in general, is very moving. Their opinions flip-flop throughout the story, and while Lucille is steadfast in her love and acceptance of Jacob, and Harold struggles to reconcile this Jacob with the Jacob they lost, nothing is that cut and dry. Lucille can be a frustrating character, because she comes off as preachy and judgmental at times, but she grew on me as I read. We get interesting glimpses at the secondary characters, including Agent Bellamy, a government representative who works with the Returned and has a lot of conflicts over his work. One of my favorite aspects of the book was the vignettes that popped up between each chapter. The vignettes all looked at a moment in the life of another member of the Returned. Sometimes they were connected to Arcadia, sometimes they were mentioned in the main story, and sometimes they just gave some added color to the way that the world was reacting to the Returned. There were a few glimpses of hope in these little snippets, but many of them were melancholy, frightening, or just unbearably sad. I'd like to think that the world would have a better response to dealing with this issue than the way it's portrayed in The Returned, but, let's face it, we don't exactly have a stellar track record dealing with people who are "others". I'm pretty sure that Jason Mott is spot on in deconstructing the way that the United States and the world in general would deal with the Returned. This book, by the way, is being developed into a television series, and will air this fall on ABC under the name "Resurrection". Based on the trailer, it seems like they've changed an awful lot from the book. I'm not sure how I feel about that, but I'll probably check it out anyway. Sound interesting? Want to read it? If you've got an address in the US or Canada, you can enter below to win one of two copies of The Returned! It was definitely an interesting read. Thanks for stopping by! I have this one on my TBR pile and after reading your review I'm looking more forward to it. It was one of those I was afraid of picking up because I might be disappointed. So now I'm ready to take the plunge. Awesome, I hope you enjoy it. I went into it not really knowing what to expect, but liked the fact that it was a paranormal story that was more of a character study than action/thriller. This seems like a really interesting story, and the vignettes seem like a cool bonus to the story :) Great review! I don't know about this one. Don't get me wrong, it sounds like a truly wonderful, haunting story. But I have lost too many people, and I don't know that I could handle this one on an emotional level. I don't know if the questions that are posed in the story are questions that I would want to reflect on. Who knows? I may change my mind and read it, see what it is all about. But I just don't know. I did very much enjoy reading your review, though. And on another note, fast-paced is great. I love it most of the time. But sometimes, the slow-burn is even better! But seriously, this sounds like a book that will really capture my attention. Thanks for sharing your thoughts on this book for the tour!